The WCWC is working hard to give operators/mechanics the training they want and need. Maintenancefest, one of our new programs, was a hit! 110 operators had a tremendous, hands-on training experience at the WCWC. 109 participants were so pleased they are ready to recommend Maintenancefest to others. Expect to see Maintenancefest at the Centre again, in the last week of August 2012. Another new hands-on course will be offered soon. Operation of Conventional Water Treatment Processes provides participants practical experience in analysis, operations, chemical feed systems, monitoring/data interpretation, backwashing and disinfection. Receive 1.9 CEUs and a great training experience at the WCWC on November 8, 9 & 10. Course fee is only $450. “Operators/Mechanics have told us they want great hands-on training. We are listening. Maintenancefest gives short, intensive modules for an introduction, or a refresher, of specific skills. The new 3-day course provides deep, hands-on learning.” – Larry Moore, CEO. Taste & Odour – Science & Practice is WCWC’s 2011 offering in its Fall Seminar Series. Receive authoritative information on taste & odour in drinking water from academic and practical perspectives. Course fee is only $99.99. From April to August 2011, over 150 post-secondary students experienced 2.5 days of hands-on training at the WCWC. This is a 300% increase and we expect this program to expand even further in 2012. “Ontario’s Colleges and Universities are training the water operators/mechanics and water scientists/engineers of the future. We give them the hands-on training they value.” – Souleymane Ndiongue, Manager of WCWC Research & Technology Institute. Thirteen First Nations operators were the first to successfully complete the new Operation of Conventional Water Treatment Processes course in April 2011. This course is part of our renewed commitment to support First Nation water operators. The Ministry of the Environment has entrusted WCWC with the development of the new Mandatory Certificate Renewal Course. It will be available in early 2012. “WCWC is expanding its training program. We are relentless in improving all aspects of the training experience. We are looking forward to the establishment of the WCWC Training Advisory Council. They will help us do an even better job of meeting the training needs of Ontario’s water operators.” – Brian Jobb, Manager of WCWC Training Institute. The Walkerton Clean Water Centre (WCWC) is an agency of the Government of Ontario, in existence for the sole purpose of safeguarding and protecting Ontario’s drinking water by providing operator training, practical research, technology demonstration and support for the development of new technologies and services. 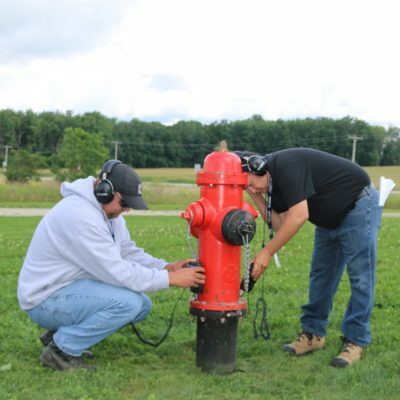 Hands-on training on operation and maintenance of water treatment, monitoring and distribution equipment is available to owners, operators, researchers and students of Ontario’s drinking water systems, including those serving small, remote and First Nations systems. Since its inception in 2004, the WCWC has trained more than 30,000 participants. The modern facility increases WCWC’s training capacity with two more training rooms and a larger area for hands-on training and technology demonstration. The facility opened in June 2010, achieving Certified LEED Gold designation by the Canada Green Building Council in August 2011.